Note: Once a week I share a popular post from the archives. This post was originally published in January 2013. 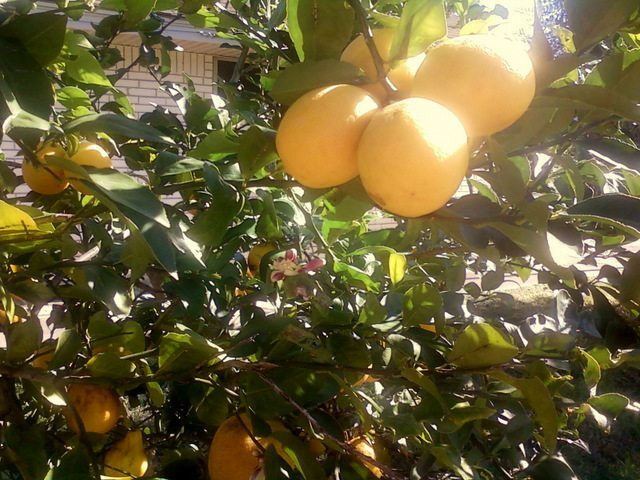 Although we have quite a few citrus trees all but one lemon tree are very young and did not produce this year. 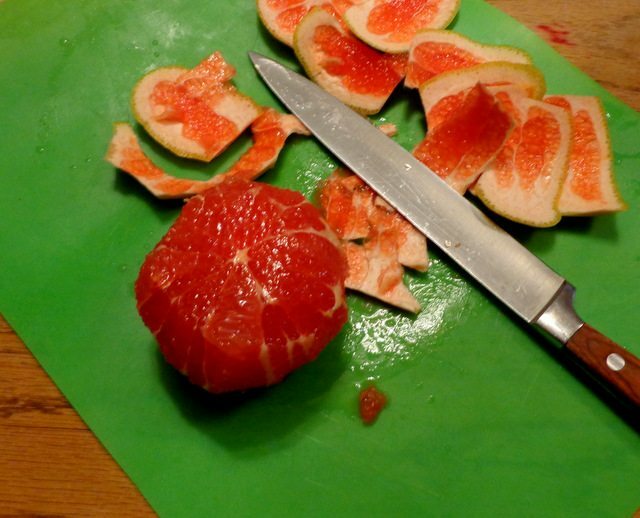 Thank goodness we have friends who have the most amazing grapefruit and lots of it. Open the grapefruit up and begin taking the pulp out of the casings. You might need to use the knife to loosen the casing at times. 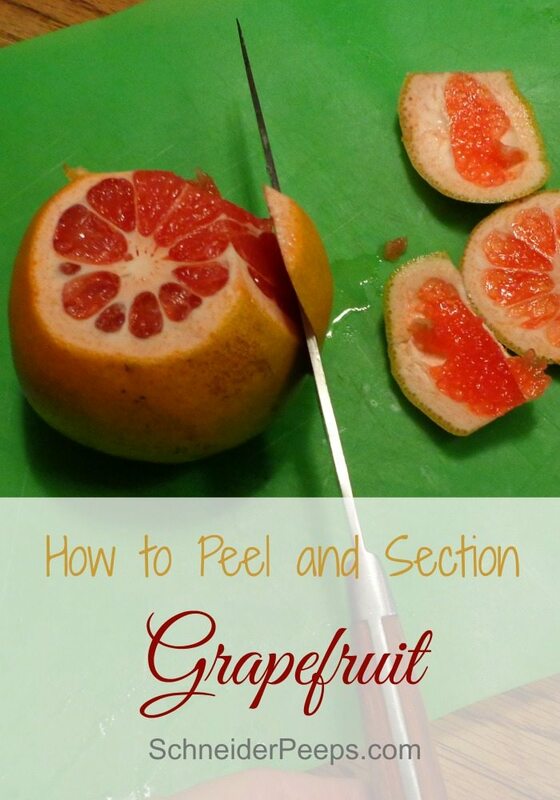 There you have it, a super simple way to peel and segment grapefruit. What fruits are you enjoying right now? 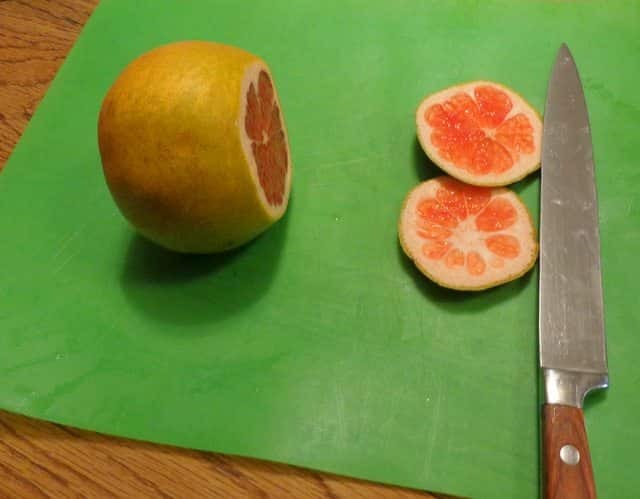 The grapefruit looks amazing. Yummy! I bought a bag from the store. I can’t believe how expensive citrus is. Ugh! I know, even here I think it’s expensive. And yet as you drive around you see all kinds of citrus trees with fruit that is just dropping because no one is eating it. The usual excuse is that there’s too many seeds…crazy. I know. My kids are always complaining about seeds in fruit. Seriously? It gets ridiculous. In Europe, they eat the cores of apples and pears. Ha! I actually have a grapefruit spoon. 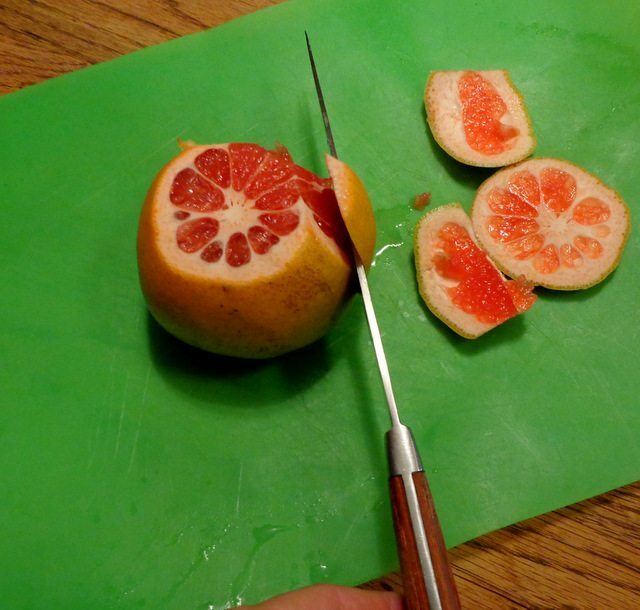 I used to use the grapefruit knife from Pampered Chef. I have four of the! I prefer the spoon. It’s funny, I am craving a grapefruit again. Yummy! We love grapefruit! Just the other day I found 18-pound bags of grapefruit at Wal-Mart for $2.96 per bag! This was the first time I have ever found grapefruit this cheap. We have been feasting on them each day; my favorite way to eat them is to peel like an orange, tear back the inside skin and eat the pulp. Yum! That is an amazing price! 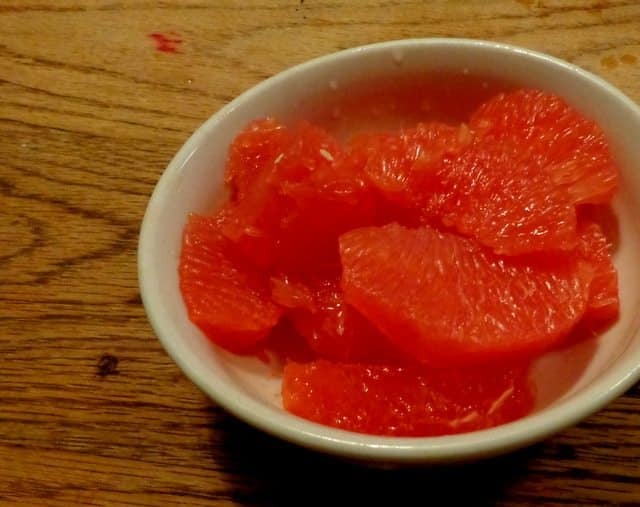 Our friend who grows the grapefruit said that she had grapefruit in refrigerator all the way until June last year. She said the peel dried out but the inside was fine. So you might want to stock up. Are you serious???? LOL. You have to use a really sharp knife, or just do it the way you like. OH MY YUMNESS! That looks like the world’s best grapefruit! 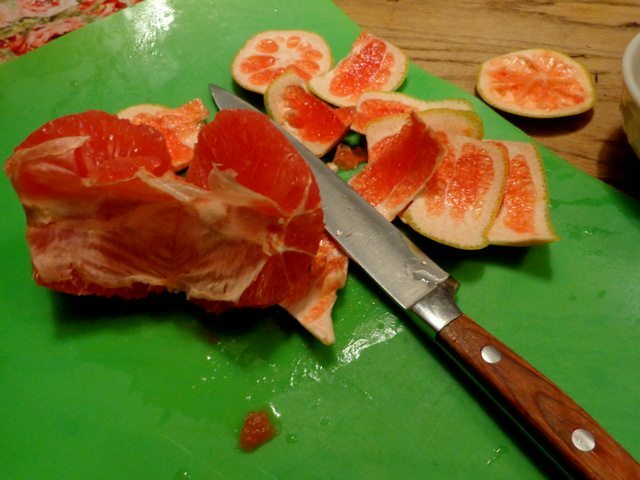 Grapefruit is so delicious! Peeling it and keeping sections in the fridge is a great idea! Looks wonderful!! And yummy. I actually cut up the entire or 1/2 of grapefruit and add to smoothie. When eating, I actually cut in half; cut into slices (with rind on, after thorough washing); and dip in plain greek style yogurt. Actually delicious. If for any reason, I do not feel ‘right’ about the rind, I just cut it off, but leave the white pulp which is loaded with nutrients and vitamin C.
Those are great tips, Wendy! Thanks so much for sharing. The rind and pith is sooooo bitter. But I do dehydrate it and use it for teas with other herbs.